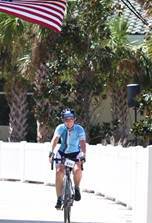 With your generous support and encouragement, I completed 100 miles for the JDRF Ride to Cure Diabetes in Amelia Island, Florida! Wonderful. Beautiful. Joyful. And so hot! This was my second JDRF Ride, both overall and this year, and I thought I knew what to expect. Though the ride agenda was the same, the ride itself and the experience was very different for me. We flew instead of drove which meant bike transport logistics, packing differences, and bus to the resort. It seemed to happen so fast! Once I’d checked in and retrieved my bike, I spent some time relaxing and exploring and grabbing some much needed food. The ride location was centered on the resort, which was right on the beach offering some beautiful views and a much different feel than La Crosse’s city setting. The view from my room was amazing. Thursday’s welcome dinner and camaraderie were great! It was such a nice way to relax and meet people. We had a beautiful full moon which was breathtaking to see over the beach and through the swaying palm trees near the pool. Many of the riders gathered outside in the evening near the fire pits to chat and get to know each other. It was fun meeting others and hearing so many stories. Friday dawned early, and, after the mandatory safety meeting, it was off for a quick tune up ride to ensure our bikes were ready to go for Saturday. It was a nice short ride through the resort grounds, and a great way to loosen up. Later, Friday’s pre-ride Dinner Celebration and Awards, was emotional and inspiring! I met even more people, learning why they ride. So many youth riders were there! I am in awe of their determination and commitment, as well as their parents who ride with them. They ride for themselves, their siblings, and their friends to find a cure and to make life better. Their parents who ride with them inspire me with their courage; it must be scary sometimes, to not only allow, but encourage your child to tackle a long ride while managing their disease. Gary, one of my Indiana teammates, was officially honored during the celebration with his Silver Jersey for riding in 10 JDRF Rides! WOW. After a wonderful dinner, it was off to bed. Tomorrow was the big day. 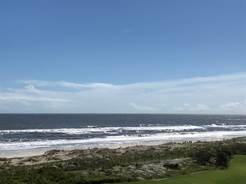 The weather looked great- no more rain in the forecast- YAY! We rode out near the front with the first group. It was already very warm. For a bit we rode under a canopy of oaks which were so beautiful and so unusual for Florida. It also provided some welcome shade. As we turned out of the resort and rode along the A4, the sun continued to rise over the ocean. I hadn’t anticipated having such a view as we rode. Such an unexpected wonder! We rode through a state park where the tree cover was so cooling. It was so quiet, perfect for the morning. This ride was very flat (except for the bridges! Oh the bridges!) and very hot. I was soaked through in the first 15 miles. The temps continued to climb – 80° temps and 80% humidity! I made friends with Irene from the Danish team. We chatted along the way and encouraged each other. I would see her multiple times over the 100 miles. The first 75 miles were some of my fastest ever for a long ride! Later I started to get tired…did I mention the bridges? And it was now windy especially at the top of some of the bridges. On the last one before we started on the last leg of the ride, I actually had to pedal to go downhill! Finally, though, the wind was at our backs, and only 15 miles to go. 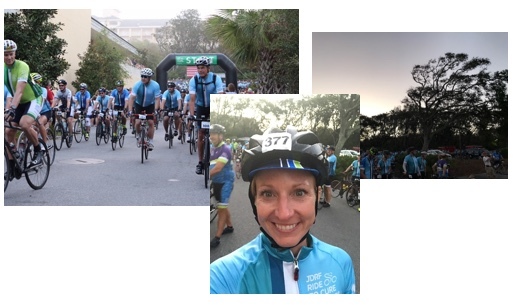 With lots of encouragement, I rode in…WOW! Pure joy. I did it- again! We were some of the first riders in, that was a first for me, and an incredible feeling! I couldn’t have done this without you –Thank you for sharing the journey and joy with me as we seek a cure! As I close out 2018, I can’t help but look forward to 2019 and more rides to come!